- above the Belleville aqueduct, the water manholes serving several purposes: collecting water, inspecting and maintaining the underground water pipes. - the last days of the Paris Commune (French revolution from March, 28 to May, 28, 1871), rue Haxo. We will also discover many green village-like places with pretty small houses and gardens. 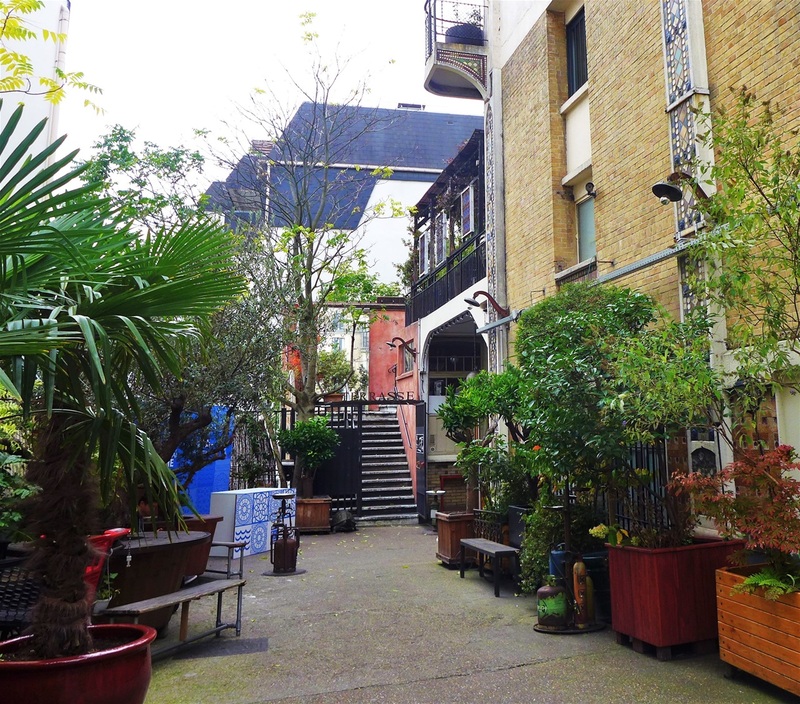 However, some places like Cité Leroy had to fight to keep and develop their environment. Indeed, you will understand as soon as you arrive at Place des Fêtes, how much the massive urbanization, starting in the 70s, could transform this country village like district. Cost effectiveness led to several architectural errors and many places of the old Belleville disappeared forever within the concrete. Every year in May, artists of Belleville open their studios to the public. Beyond their obvious artistic interest, it is a very nice opportunity to discover quaint narrow alleys and courtyards, which can provide an insight of the old village. We will arrive at metro station Place des Fêtes. We will see Belleville manholes above the aqueduct, starting with the manhole de la Lanterne, rue Augustin Thiery, going on rue des Solitaires, rues de la Palestine, then reaching rue des Cascades where we will see two other old manholes. Then we will walk to rue Boyer to see this historical place, la Bellevilloise, a former worker co-op. Better to come during the week-ends in order to enjoy this place, escaped from the control of property developers. It is now a centre with a restaurant, a terrace providing concerts and multidisciplinary events. Before reaching rue Haxo, we will take hidden pathways: Villa de l’ Ermitage, Cité Leroy, Villa du Borrégo. We will continue using other country like spots, passage du Monténégro, rue Paul de Kock and rue Emile Desvaux and finally stop at the metro station Télégraphe. 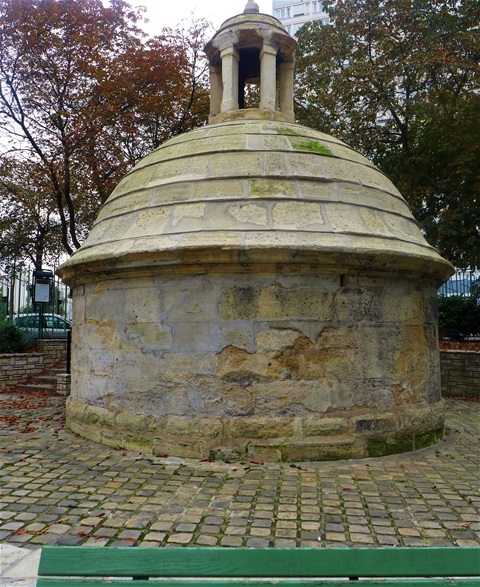 Manholes are the visible remains of the old underground pipelines supplying Paris with spring water. These small stone buildings were giving access to the pipelines for their control and maintenance. The Belleville Aqueduct which was capturing the water running on the southern side of the Belleville was starting at the manhole of la Lanterne (historic monument). This massive stone construction built in the 16th century includes a set of stairs leading to a basin where the water was collected and then distributed to the aqueduct. Generally, it can be visited during the Heritage Days. Let’s go back rue Petitot and let’s continue straight on rue des Solitaires. Today, from the fifteen manholes controlling the Belleville aqueduct, very few are visible. 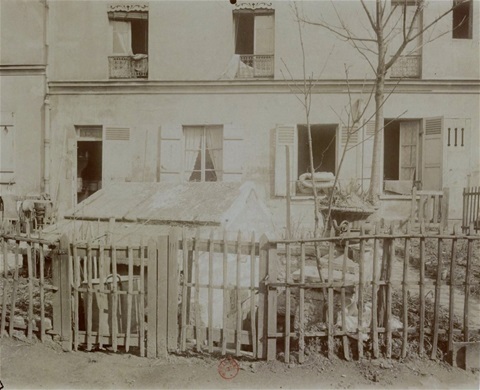 Thus, the manhole des Marais, captured by Atget was demolished in 1904. Let’s turn left on rue de Palestine. 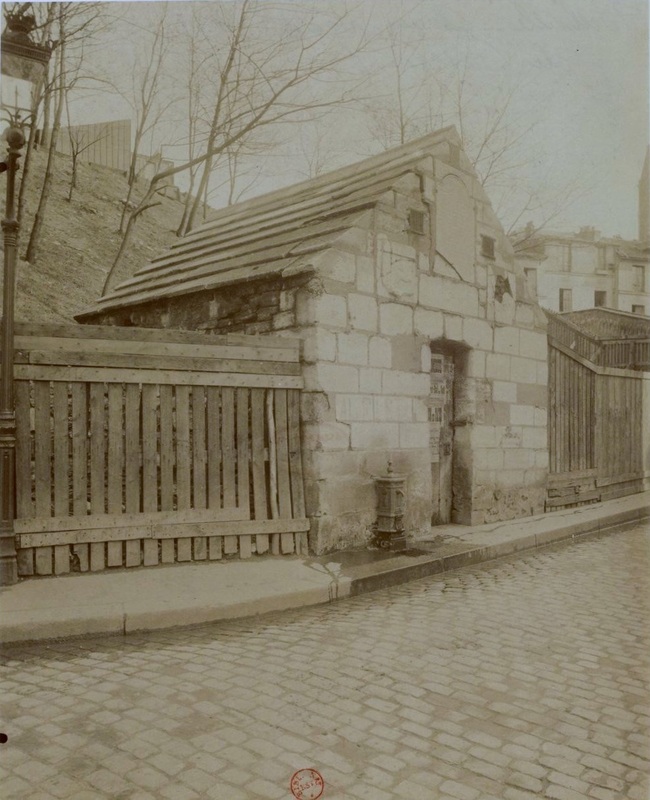 As shown by the photo taken by Atget in 1901, the former manhole du Chaudron was outside. It looks quite a small hut with the barrel and the hen house. 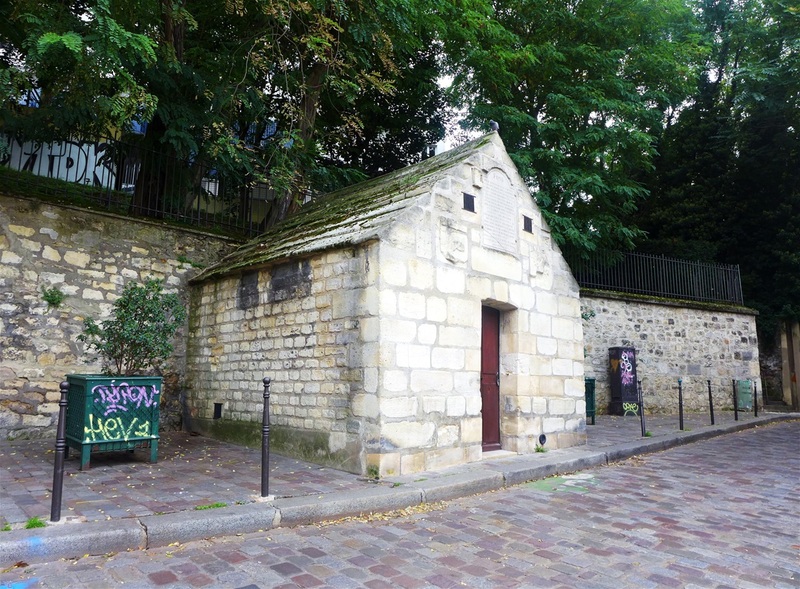 Let's go on rue de Palestine where we can see now the rear of the church Saint-Baptiste. The church was built in the 19th century per a very popular neo-gothic style. 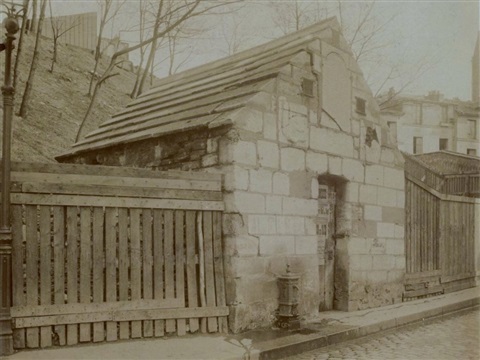 The former church, standing in the centre of the village of Belleville surrounded by the cemetery, was destroyed in 1854. The new cemetery of Belleville, was relocated on the former Ménilmontant Park. Let's cross rue de Belleville and let's take rue de Jourdain up place des Grandes Rigoles (Large Channels square) ; this name like rue des Cascades (Waterfall Street), rue des Rigoles (Channels Street), rue de la Mare (Pond Street), rue de la Duée (Spurting Source Street) recall how plentiful was the access to spring water in Belleville. Let’s take rue Levert to the right up place Henri Krasucki, then rue des Cascades on the left. Our tour in the district of La Bastille is referring to the Apaches, or young gangsters, who in the 1900's, were coming from their headquarters in Belleville to the dance halls called musettes rue de Lappe. These apaches are the characters of the movie Casque d'Or (the Golden Helmet), directed by Jacques Becker, with Manda the carpenter (Serge Reggiani) and the member of a criminal syndicate led by Fèlix Leca (Claude Dauphin). 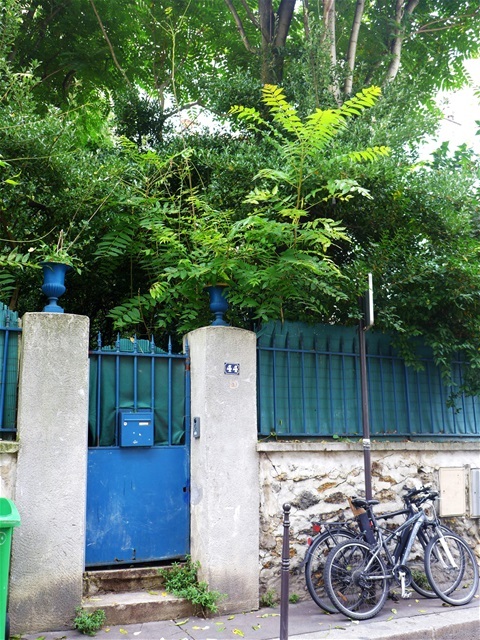 44, rue des Cascades is one of the shot locations, as this is where Leca is living; This is where the blond and beautiful Marie, called the Golden Helmet (Simone Signoret) comes to seek help from Leca and arrange her lover Manda's escape from prison. The movie is ending with the music of the song Le Temps des Cerises (The time of Cherries). This song is also strongly associated with the Paris Commune and it is not surprising that it is the name of the libertarian cultural space, located to the near 42 ter, rue des Cascades. Quite a symbol of the community spirit which has always made its mark on the district. The goal of this association, created by Lucio Artabia is to support young artists outside the usual commercial channels. After the curve in the street, at Nr 42, we will find the Saint-Martin manhole, at the top of rue de Savies. 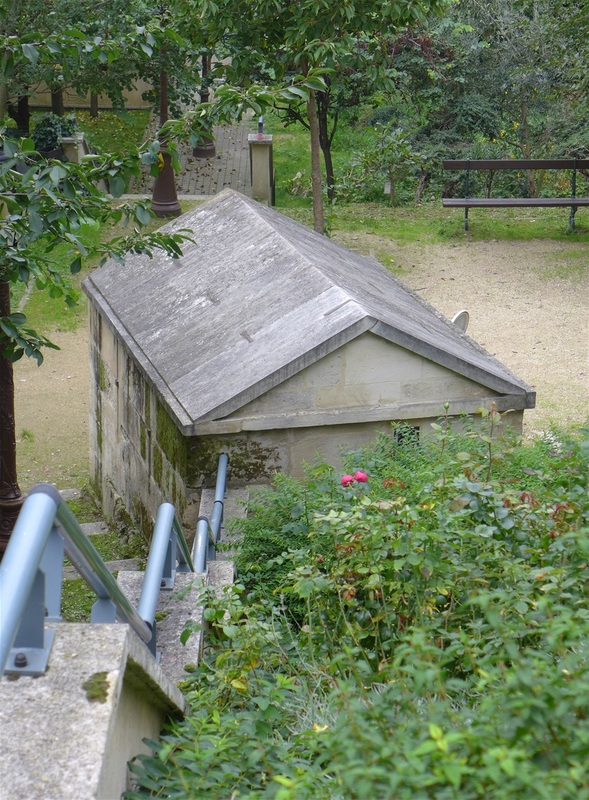 Since the 12th century, the Belleville's springs were also used by the religious of the Saint-Martin-des-Champs abbey and by the Templar all located in the same area. 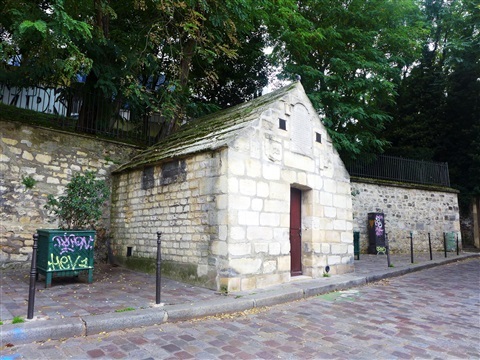 The spring water was flowing out rue de Savies on a land belonging to the Saint-Martin-des-Champs abbey, then drained and conducted to the Saint-Martin manhole from which a special pipe was bringing water to the Knights Templar. 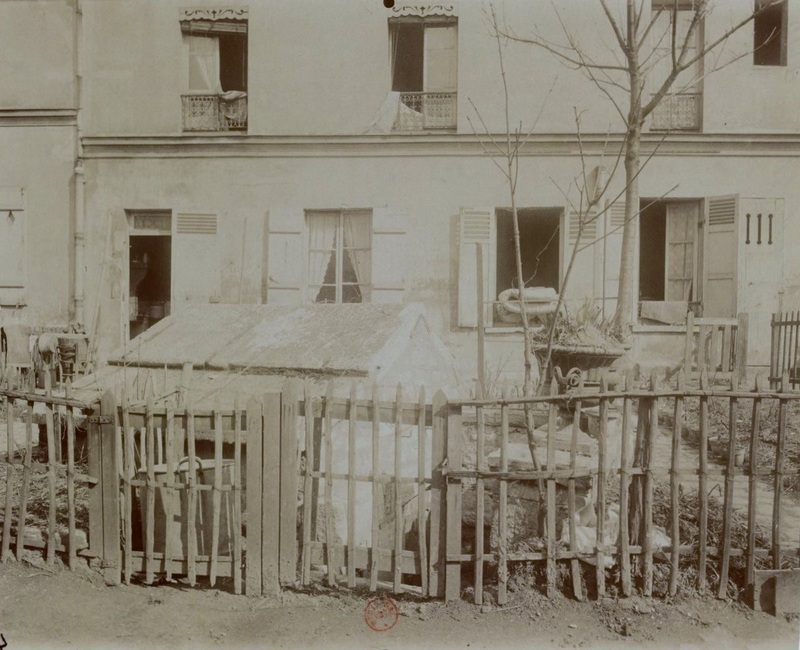 A little bit further at nr 17, rue des Cascades, the Messiers manhole is still visible in a yard beneath the street. Let's now continue up to rue de Ménilmontant, that we take on the left, then we turn on the right in rue Boyer. 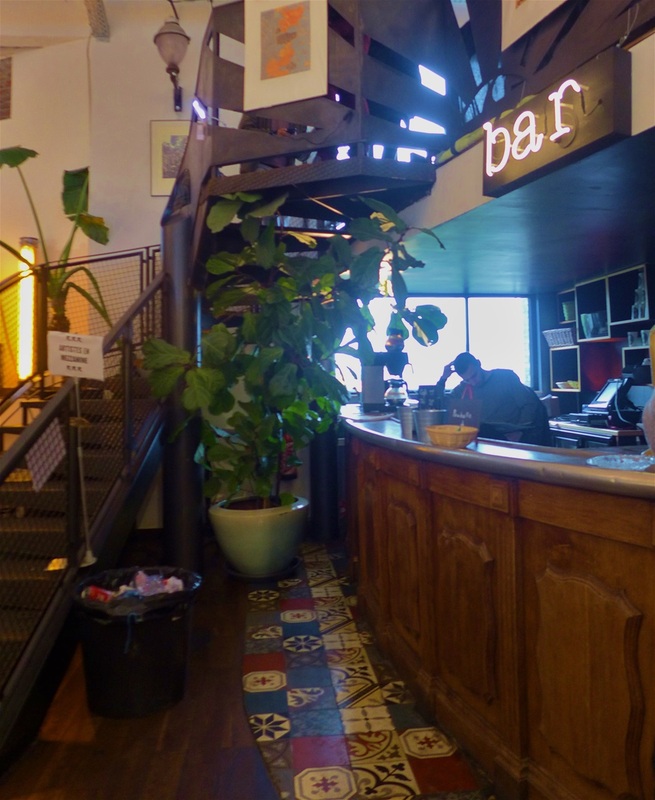 Since 2006, la Bellevilloise is a large space with cafes and terraces dedicated to concerts, events, markets (books, producers), fairs (like the grand salon de l'art abordable - Affordable Art Fair). In 1892, the creation of a bakery at 23, rue Boyer was the starting point of its implementation in the street. Starting 1897, it bought all the plots between Nr 19 and 25 of the street, opened a deli, a café at Nr 19. In 1910, the cooperative built the buildings that we see today between Nrs 19 and 21: the House of People. Its success was big and it was backed by almost ten thousand members in 1914. To celebrate its fiftieth anniversary, la Bellevilloise built the red brick building at n° 25, which shows their membership to the communist party in 1924 with the motto Science and Work and the hammer and sickle on the entablature. Then, with the crisis in 1930s, it started to collapse. 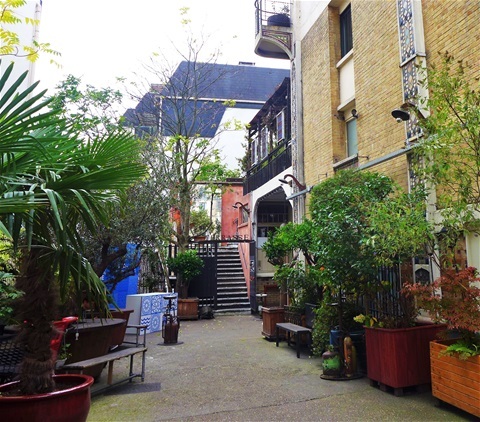 Each building was sold and hosting various activities like a factory of bags and satchels, a school of dance, a pension fund … until 2000 when it was pried out of the hands of real estate agents to become this trendy and informal space.